The 500-acre Liberty University Equestrian Center is NEW even by Liberty standards, and continuously growing and expanding. Horses enjoy 140 acres of pastures with good grass and automatic waterers, Kinesiology riders use the 120’ long Barn 1, students can bring their horses to school to live in the 240’ Boarding Barn, Equestrian Team athletes use the 240’ Team Barn and it's facilities. All share use of the 300’x120’ outdoor riding arena, and 300’x120’ Indoor riding arena. The Equestrian Center also includes a 20 stall guest barn for horses visiting for horse shows, plus a hay barn and workshop. The south end of the complex is the “retirement farm” where older horses can be kept after they retire from the lesson program. It includes two 4-stall barns, a small covered work area, and outdoor arena where Liberty conducts Therapeutic Horsemanship activities for stress and PTSD. 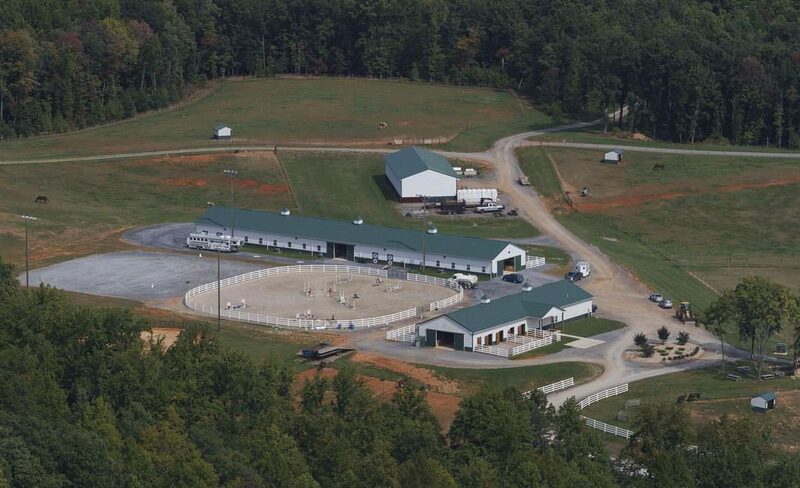 Indoor Riding Arena is 120’x300’, as large as any collegiate indoor in Virginia. Footing is kyanite sand mixed with rubber and Euro-Fiber atop a packed sand base. A polymer sand additive holds moisture in the footing and holds it firm. New LED lighting provides extraordinary bright riding area. Three large cupolas exhaust hot air out the top, while five 14’ ceiling fans circulate air throughout the building. A large concrete pad extends down one side of the arena, with bleacher seating for about 200 people and ceiling fans blowing above the bleachers. There is also an enclosed, heated judge /announcer stand, with 3000 watt PA system. Outdoor Riding Arena is 120’x300’. Footing is Virginia river sand, and underground drainage carries rain water off to a nearby retention pond. A polymer sand additive holds moisture in the footing, and large pressurized water cannons prevent dust in the footing. Large stadium lights illuminate the arena at night. Guest Barn is a lean off of the indoor arena, with room for 20 portable guest stalls used for horses visiting for horse shows. 10 x 12' portable stalls have electrical service for fans. Hay Barn is a 40' x 80' building that holds thousands of bales of hay storage, plus it includes a heated workshop area.